I always share Ryans car. Ryan wanted something with more top end so he switched from stock turbo to a PTE 6057. This is the first time i tuned this turbo, but i believe it flows 62lb/min which is 6lb/min shy of an FP Black, however being non stock frame and etc, it performed quite well. 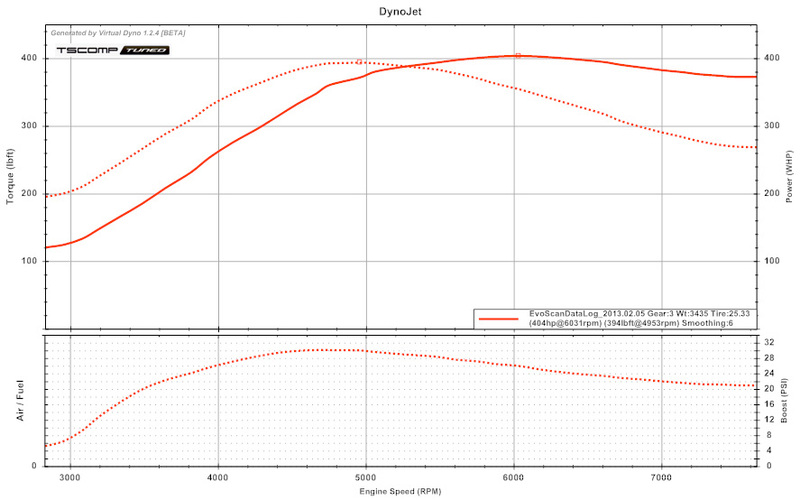 Ryans cars still on stock headstuds, and the fuel seemed to be E70 or so, so i did not push it further then this. I am pretty sure it will go higher though, but touching 34psi uptop is enough and he is happy as it sits. his goal was anything over 500whp. 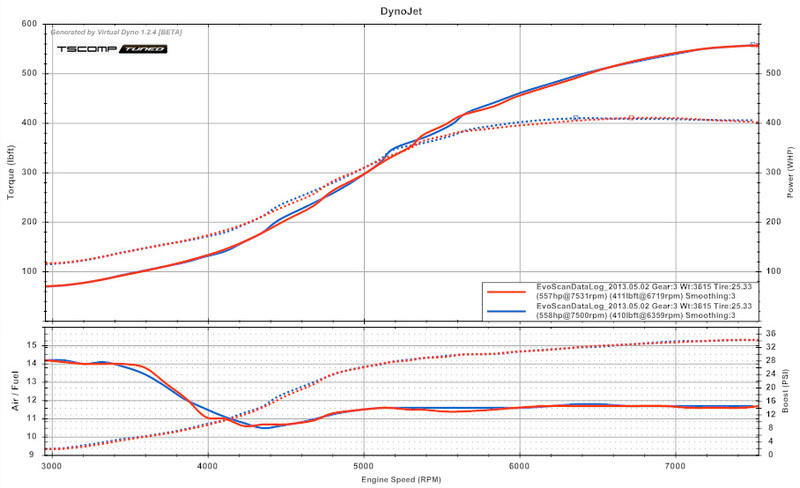 I tried to keep torque down as much as possible, so note the boost curve as it rises as the RPM's increase. Last edited by tscompusa; May 2, 2013 at 09:08 PM. I still prefer smoothing 6 and think its the most accurate. Last edited by tscompusa; May 2, 2013 at 08:58 PM. the 6057 is close to the flow rate of the newer 5858 cea? Wow. Is all i have to say at this power level. When i was at 350 going to 400 with those kelford cams.. It was an awesome jump in power and felt great but it was still lacking what i really wanted. Top end. To acheive that i got a good deal on this turbo kit and wala.. i got my top end! It pulls so hard when this thing spools i love it. Tom does a very fantastic job on holding these stock blocks together.. specially stock head studs. Also on another important note, The SD conversion was a breeze and the driveability is so legend... wait for it.. dary! hahah. but seriously the throttle response is nice an crisp, shifting through the gears is effortless without having the car buck or just have a little harsh engagement, and also the taking off from a stoplight is the easiest thing to do now since i have a PUCK clutch, before you had to either blip it quick or slip it wich chattered and bucked really bad.. But now you barely need any throttle and takes off like butter. THANK YOU TOM! (BTW i need to give a few non-believers a ride in it just to show them what Tom can do on SD with stock ECU). All in all thanks to Tom for giving me the power i wanted. It makes it easy when he can take over your computer and tune the car.. But i still get to do the pulls which is an awesome experience just because you get to feel the power difference in each pull. But thanks again tom for supplying parts and great tuning service! Thanks Ozzie! we need to put yours on the dyno and share it also! you have a buschur beast! To bad roads are like roller coasters in cali up down up down so we cant get a good vd to share. have you sorted the fueling issue out yet? I have no idea what its comparable to. But ya ive even done over 600whp cars on stock studs. If the tune is really good and you never experience cylinder pressure spikes or any kind of detonation then the stock HG seal is perfectly fine. I would still recommend atleast a standard ARP stud. I dont feel an L19 H11 steel is really necessary on any car really, but they are like L19 rod bolts, just reassurance i suppose. This car is running lower timing then i typically run on e85, once he throws in real e85 and tests it to confirm its 85% ethanol then ill bump it up more and share the better #'s if the fuel allows it. I knew you would like the drivability. you should take it to a track if you have one nearby. i bet it goes 128+. I notice on the E cars you tune, you always dip it in the high 10's in the low-mid4k rpm range, any particular reasoning? hahah yes I def had some fun with the yesterday . 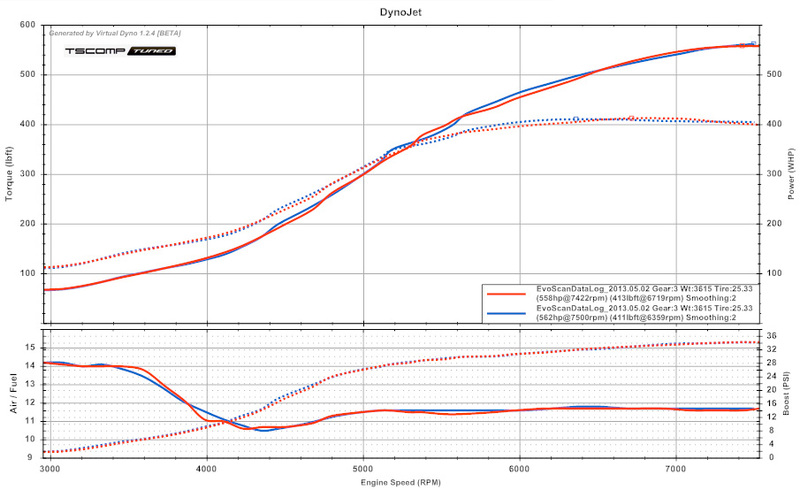 I never thought the power difference would be this substantial going from 400 to 550. love the turbo set up. Everyone wonders wth is going on when i floor it at 3500 beacuse its just no spool and then at 5k ish range it just puuulllss and keeps pulling!.. You should just see the expressions on everyones face hahah. Honestly i was really worried about my power band with it being short and useless but no, turbo lag.. nah. its so much fun to drive. couldnt be happier. yes idk when they will switch around here to e85 but who knows itll probably stay e70 just because not many people use that much ethonal and they wont put summer blend in.. idk i guess. i found a place though that i hear people say that its pure e85 so if thats the case ill just get a tank full of that at home and be done. So yes ill get on that soon as possible! If it quits snowing here in south dakota the track will open in the next weekend or so. I will have time slips soon! And BTW tom, it saw close to 30+ pulls lastnight considering i graduated from college.. (automotive tech) i had to give some people rides ha. The car took a beating.. just shows how toms tunes are just.. awesome. i asked tom to try to fit me in before this weekend because of graduation and such.. and HE DID! I honestly really appreciate that! We will for sure Tom. This next session will be on a flat open road I've already scouted. Just waiting on the parts to come in to fix the fueling issue. Will keep you posted. I will take it here shortly. its open and taking test and tune runs but we will see! I think my buddy who races there says you need a cage at 11.4 so I need to get a good clean pass. Yes! love the feeling of the pulls just because its like... never ending very impressed. Cools Egt's downlow. been doing it since 2009. Awesome thats what i like to hear! 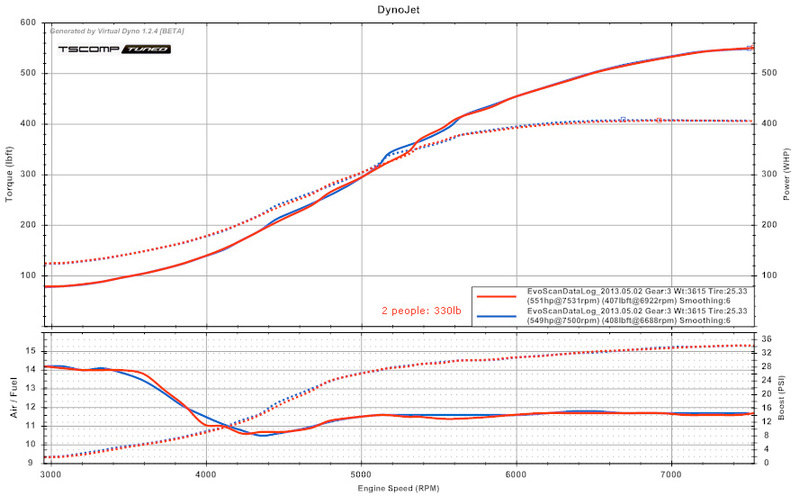 i did another really high 500WHP car right after yours also with a 6266 on 93 @ 28psi across with stock block. I will share that later on also probably. you were my 5th stock block of that week to go deep into the 500whp~ territory. Great! ya i will def share your beast. you have a similar setup to my old setup. Ok sounds good! ya bigger turbos are very fun and addicting. the bigger you get the more it feels like its pulling longer and longer. There's more timing in the car, but i opted to leave it out due to the lower ethanol content. but where it sits should be plenty for you for now. I'm really curious on the spool and power difference from my 6057 to the 6262 or 6266 so post it so I can see! haha I can't believe how many stock blocks are getting this much HP. I'll def be doing a build here sometime..